On the eve of his departure, Dr. Koshy Mathai, the IMF Representative, warned that an import substitution strategy could hurt the country’s economic development. He advised the Government to pursue policies that do not discriminate against exports by giving greater incentives to import substitution compared to export promotion and thereby creating a bias against exports. Dr. Mathai’s advice may well turn out to be the most significant counsel that he gave the country for sustained economic growth. It was broader in scope than the usual IMF statements that focus mainly on external finances of the country and related variables — and more forthright than the guarded diplomatic statements that international institutions give these days. The warning was opportune as the recent budget indicated a dangerous veering into an import substitution strategy whose deficiencies were spelled out in last week’s column. Many eminent economists have given the same advice time and again. They have pointed out that an import substitution strategy that gives greater incentives through trade regulation and financial policies to produce for the domestic market rather than for the world market hampers economic growth. Import protection, he alleged, allows politically favoured businesses to target helpless and less affluent consumers in the country without full competition from other producers and domestic producers. These favoured businesses, he pointed out, also obtain arbitrage or collect the import duties that would otherwise have gone to the state, in the same manner as a smuggler or a bootlegger does, as artificial unjust profits or ‘rents’, and can lead to the build-up of large inefficient monopolies especially in small countries. Dr. Mathai’s argument that increasing export and import taxes affect the country’s competitiveness is not easily understood. Simply stated, import duties affect the costs of production of exports as imported inputs cost more and labour costs rise with the increase in import prices. When high tariffs protect local industry, it is more profitable for local industries to cater to the protected local market rather than export. Such high cost goods due to inefficiency and higher cost of imported inputs cannot compete in international markets. Therefore high import tariffs tend to discourage exports. In addition, by giving greater incentives to import substitution, exports are disadvantaged since producers of exports have to face stiff competition from the world market while paying the same wages raised by increasing profitability of producing import substitutes. Several features of the 2014 budget, Dr. Mathai pointed out, had disincentives for exports and ultimately hurt exports. It raised taxes on imports of a series of imports including new ones such as boats, allowing boat making businessmen to target fishermen with impunity and earn rents and pharmaceutical firms to target the sick and the old. Export taxes were imposed on makers of primary goods such as rubber and cinnamon, penalising efficient producers who are exporting these. Furthermore, by attempting to increase domestic value added by export duties leads to greater inefficiency and harms input producing domestic industries. Dr. Mathai deemed it far more important to reduce the bias against exports in areas which would lead the country to produce goods in line with its comparative advantages, rather than reduce imports in order to improve the balance of payments. Providing incentives to shift into import substitution, he noted, may not be in the country’s best interests. Moreover, import substitution policies would harm exports by an appreciation of the exchange rate. He observed that Sri Lanka’s food prices are higher than in the region due to high tariffs to achieve self-sufficiency and this is hurting the poor and may be contributing to malnutrition particularly of poor children. High tariffs on basic food imports are eroding food security rather than improving it, as the access to food of the poor is weakened due to higher prices. On the other hand, a policy of cheap food would raise overall living standards and reduce wage costs, helping boost export competiveness. Higher salaries paid by import substitution businesses will also raise overall salaries and costs of production but workers themselves will not benefit due to higher overall price levels due to protection. The argument for high tariffs on food imports to increase food security is based on the misconception that food security is synonymous with food self-sufficiency. Many developed countries are not self-sufficient in food, but enjoy food security, as they are able to import their requirements of food. The country should produce more food provided such domestic production is not at high cost. In fact increased efficient production of food enhances food security, especially of poor rural households. The essential message of Dr. Mathai was that the movement towards an import substitution strategy was an anti-export strategy. 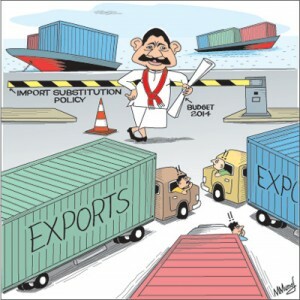 It failed hopelessly in the 1970-1977 era of import controls in Sri Lanka and was the root cause for slow economic growth in countries that adopted such inward looking policies. The spurt in growth of East Asian and South East Asian counties was due to their liberalisation of trade and export led strategy. Countries that adopted import substitution strategies like India and Communist countries such as China and Vietnam have developed rapidly owing to their trade liberalisation and export led growth. Why don’t we learn from our own past experience and the experience of other countries that Dr. Mathai pointed out convincingly?